According to the Renewables 2016 Global Status Report, as of early 2016, there was a total of 173 countries that had renewable energy targets in place. China is leading renewable energy growth, followed by the US, Japan, the UK, and India. China also leads in non-hydro renewables, followed by the US, Brazil, Germany, and Canada. However, the per capita renewables is led by Denmark, Germany, Sweden, Spain, and Portugal. When country's GDP are factored, the biggest investors were small countries like Mauritania, Honduras, Uruguay and Jamaica. Europe is showing that 100 percent renewable energy is possible. The Renewables 2016 Global Status Report shows that in Europe green energy is now the leading source of electricity, providing 44 percent of total EU capacity in 2015. Germany is one of the world's renewable energy superpowers. The country generated so much renewable energy last spring that utilities paid users to consume electricity. 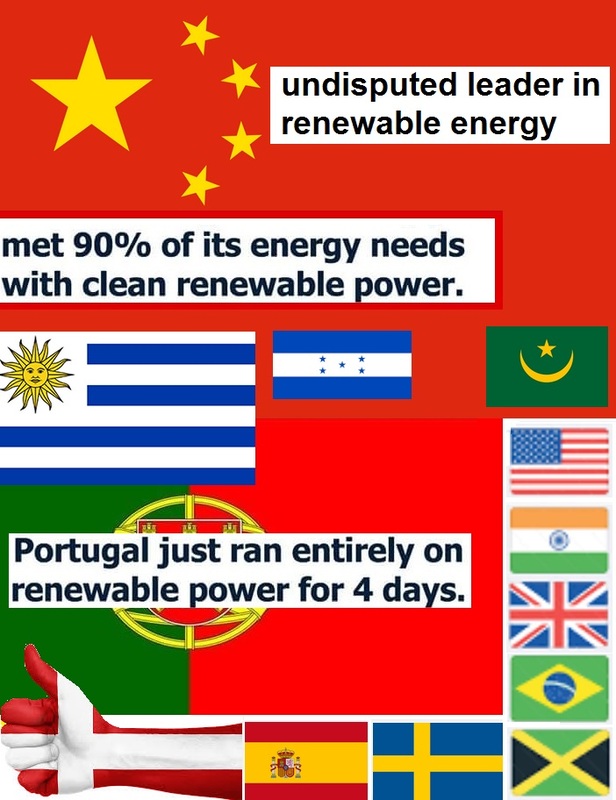 We have seen renewable energy records set in Portugal and at least ten other countries are showing real leadership on the renewable energy front. Despite the nation's political ambivalence, we are seeing leadership from countries like Australia with projects that include the Clements Gap Wind Farm. In the US the renewable energy industry will be buoyed by the extension to the wind energy Production Tax Credit (PTC) and Investment Tax Credit (ITC). According to some congressional support for wind will double the number of installations between 2016 and 2020. U.S wind power now has more than 70 GW of installed capacity. Led by China Asia will continue to be the undisputed leader in wind energy. In addition to China Japan, India, Vietnam, Mongolia, Indonesia, Pakistan, Thailand, and the Philippines will all likely see tremendous growth in wind power.